Dazzling waters, long stretches of white sand beach, and the splendid colors of nearby mineral cliffs typify Maceio, the laid-back capital of Alagoas state. Steadily growing in popularity among international visitors, the modern city of nearly a million people has long been admired by Brazilian tourists, yet still retains its authentic, unspoiled atmosphere. One of the top things to do in Maceio happens on Sundays, when the city center closes to traffic and revelers gather for wild street parties, dancing, live music, and celebration. On the quieter end of things, surrounding lagoons and countless pristine beaches give plenty of opportunities for nature tourism in Maceio. Maceio is in State of Alagoas (AL). 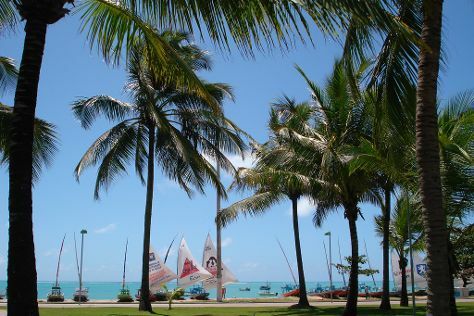 Use our Brazil tour builder to arrange the hows, wheres, and whens of your trip to Maceio.